We've all biked through Melbourne, crawled our way in peak hour traffic through the city, some of us have been on boat cruises along the Yarra (most likely consuming a little too much wine to care about the scenery) and without doubt we've waded our way through the crowded streets of the CBD. But how about seeing Melbourne from a different perspective? 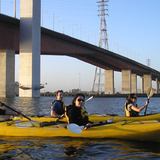 One that has you paddling under the Bolte Bridge at night rather than driving over it? Kayak Melbourne, a tour with a difference, offers you the opportunity to kayak down the Yarra River on a gorgeous summer's night all the while soaking in the sights and sounds of our lively city. Take in the awesome views of the city skyline as your sea kayak gently winds down the tranquil Yarra River right into the very heart of the city. Kayak Melbourne allows you to travel along a path of Melbourne that you would not normally encounter in your daily travels, showing you a decidedly new way of looking at a familiar face. Easily accessible to all, there is absolutely no kayak experience required, so even those friends who consider channel surfing a sport can join in (remote in hand if necessary). All participants are free to travel along the serene waters at their own pace and are proficiently guided by patient instructors every step of the way. Tours begin at Victoria Harbour Docklands where a safety brief and introduction to paddling techniques allow you to get the maximum enjoyment (and minimal discomfort!) out of the tour. 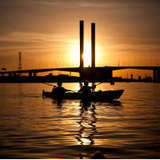 Before you know it you will have hit the water and having become acquainted with your very own state of the art Sea Bear kayak in the Docklands area before tucking into some fish and chips from the FishBar, a truly unique "on water" dining experience. Once you have loaded up on carbohydrates, fuel for your trip no doubt, it is time to make the journey into the city. Continue along upstream, under the aforementioned Bolte Bridge and into Melbourne's downtown, past the lavish Crown Casino and chic Southbank and on to Flinders Street Railway station before you make the approach to one of the world's most famous sporting precincts. The tour comes to an end at the Boat landing area in Southgate, perfect walking distance to some of Melbourne's finer restaurants and bars and just a short stroll to the Eureka Tower Observation Deck. If seeing the city by sea isn't enough, then Kayak Melbourne offers the new "River to Sky Tour" which combines paddling the river with the breathtaking views of Melbourne surrounds from the city's (and not to mention the Southern Hemisphere's) tallest Observation tower, Eureka Skydeck 88 - an experience above all else. With the choice of 4 tours, Kayak Melbourne covers all bases including, Discover Docklands (a 1.5 hour tour of Docklands harbour), Moonlight Kayak Tour (2.5 hour tour beginning at Docklands and ending at Southgate), the Moonlight Kayak Tour "Unplugged" (Moonlight Kayak with a difference, enjoying wine and live music along the way) and the River to Sky Tour. So as the sun goes down and the city comes to life, there is no better way to see Melbourne city from your unique water level perspective. What better way to spend a warm summer's night? Get on board and "sea" our city for what it truly is! Why? See Melbourne from a different perspective and experience the spiritual heart of the city by kayaking the famed Yarra River. Where: Tours depart from Shed 4 Victoria Harbour Promenade, Docklands and conclude at the Parks Victoria landing at Southgate.